Visitors to the Massachusetts Conference’s Edwards House – both those coming in person and online – have been seeing a lot of changes lately. Changes to the physical property include the addition of a stone and brick labyrinth on the front lawn of the house, new furnishings in the bedrooms, cloth table covers in the dining room – and even some new faces in the kitchen during weekday meetings. In the virtual world, Edwards House has a brand new website at www.edwardshouseframingham.org and now has listings on websites such as yelp.com, retreatfinder.com and others. New reservation software has also been put into use. 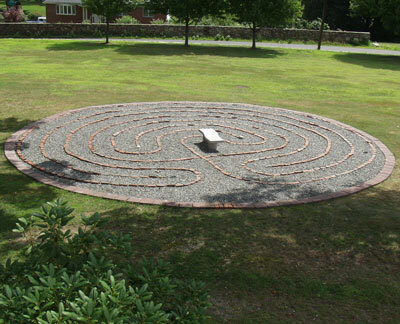 This labyrinth was installed on the front lawn of Edwards House this summer. To see more pictures of the improved Edwards House, visit: www.edwardshouseframingham.org. All of these changes are in response to recommendations by Kaleidoscope Consulting Group, which was hired by the Conference to determine whether Edwards House and Pilgrim Day Camp – both housed on the same property in Framingham as the Conference’s main office – were continuing to serve the mission of the Conference. “Throughout the 1990’s and through 2004, the Framingham site not only contributed to our mission by housing Conference offices and providing meeting space for Conference commissions, task forces, committees, staff and Board, it was also a net generator of revenue for the Conference,” said Associate Conference Minister Dawn Hammond. While income from Edwards House was never enough to cover the operational costs of the meeting facility and the offices at that time, the day camp income more than made up for that. “However, the economic balance started to change around 2005. As in all our local churches, base costs of things like utilities and insurance were increasing rapidly, and we found our day camp enrollments becoming more volatile and less reliable,” Hammond said. By 2007, the Framingham site’s operations were in the red by about $140,000. That’s when the Conference Board of Directors decided to investigate whether maintaining the Framingham property was the best stewardship of Conference resources, or whether it would make more sense to sell the property and rent office space elsewhere. The Board in 2008 requested bids from consultants to study the issue, and Kaleidoscope was chosen from five firms that submitted proposals. Over the next year, the firm went over the Framingham site with a fine tooth comb. The consultants found that the property was a remarkable resource for the Conference, and that there was significant potential to reverse the revenue losses of the recent past. Not only that, but the consultants concluded that both the day camp and Edwards House should be “explicitly regarded as adjunct ministries of the Conference, rather than just operational entities,” Hammond said. For example, the consultants pointed out that Pilgrim Day Camp already reflects the United Church of Christ values of wide welcome, respect for God’s creation and ecumenical outreach. Edwards House, with a few changes, could do better at the same, they said. So the consultants made a list of recommendations for both Edwards House and Pilgrim Day Camp, which the Conference staff has been implementing over the past year. Improvements to Edwards House bedrooms has included the addition of headboards, luggage racks, nightstands and improved lighting. To see more pictures of the improved Edwards House, visit: www.edwardshouseframingham.org. Development of a website that better reflects UCC values, that better markets the property, and that allows potential guests to make online enquiries. The site was designed by Brick River Technologies of Nashua, NH, the same company that designed the Massachusetts Conference website, and its content is handled through the same back-end system. The website – and its sister site for Craigville Conference Center at craigvilleretreats.org – launched this summer. Improvements to both the site’s operations and furnishings to make it more hospitable. 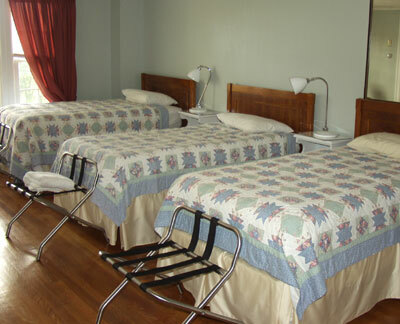 Plastic tablecloths have been replaced with cloth, and beds are now made for overnight guests. Bedroom furnishings have been upgraded with headboards, nightstands, new bedding and additional lighting. A permanent stone and brick labyrinth was installed on the front lawn of Edwards House, part of a plan to use the buildings and grounds for “passive evangelism.” Other plans in the work include developing a library of UCC-related books for use by guests and adding wall art that is expressive of UCC values. Site Manager Diane Montgomery is now spending less time in the kitchen cooking, and more time handling reservations. This allows her to better develop ongoing relationships with organizations that use the facility and going forward will give her more time to reach out to potential new customers. The improvements have been made using a $33,000 internal loan that will be repaid from Edwards House revenues. Some changes were also made at Pilgrim Day Camp in response to the Kaliedoscope analysis. The consultants found that the camp was highly successful, with a stable staff and history of excellent enrollment despite minimal marketing. But, they said, parents today demand better marketing, and more online access and communication with programs in which their children are involved. As a result, the day camp management reworked the website and brochure, initiated a DVD slideshow yearbook for participants, adopted more web-based marketing, and transitioned to online registration software. Some operational changes were also made to improve communication with parents and to invite more feedback. Moving forward, the Conference staff and board are hopeful that the changes will be effective, both in terms of generating revenue and . supporting the mission of the Conference. “Theologian Henri Nouwen wrote that hospitality means the creation of a a space where a stranger can enter and become a friend - ‘the opening of an opportunity to others to find their God and their way’. By being more intentional and holistic in the hospitality we offer at our day camp and retreat center, we hope to better embody God’s love to those who visit this beautiful corner of Framingham,” Hammond said.